Stories don’t get much simpler than this: Mama, a lonely housewife, befriends a stray chicken. That’s it. Simple, yes, but it’s with this understated simplicity that D.F. Mamea’s Still Life with Chickens catches you off-guard. Maybe it’s John Parker’s idyllic backyard set or Goretti Chadwick’s warm and generous performance or Helen Fuller’s puppet chicken (puppeteered by Hannz Fa’avae-Jackson). Whatever the reason, beneath its upbeat exterior lies a restless, beating heart. And while the theatrical puppetry is a wonderful tool, it never coasts on cuteness for the sake of it. This is Mama’s play, in all her fully-realised glory, embodying so much that is universal but always her own unique creation. Reflected in the performance by Chadwick is someone you can instantly recognise. She is the personification of humanity, but is not perfect; she has prejudices and she has been petty and vengeful. But there is nobility in her ordinary struggles. Despite never seeing any other characters, the play paints a wider picture of familiar relations that is the emotional crux of the play. The script toys with implied offstage dialogue and monologues, which are handled elegantly; monologues presented as ruminations rather than complete direct address. These are the complaints and rants of a charming grandparent that reveal deeper layers of honesty. We, the audience, are treated like voyeurs and eavesdroppers, rather than the recipient of a confession. I’m reminded of Chekhov’s belief that his works were famously interpreted as tragedies rather than comedies. And while this isn’t exactly The Cherry Orchard, underneath the trappings of puppetry and overt humour lies a similar understanding of the stillness of everyday life. We have people – or a person in this case – struggling stoically in unglamorous conditions, and there is something inconsolably human in that. Mama’s strained marriage and absent children offer an absence yearning to be filled. We glimpse the tensions, disturbances and secrets that you’d find in any serious domestic drama, but it is, first and foremost, a comedy. A comedy unafraid of the uncomfortable truths of life. 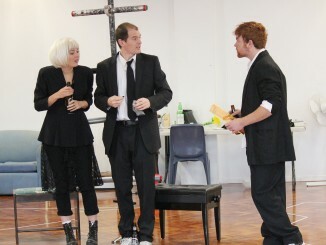 It’s a short play at barely an hour, but it’s tightly constructed with little fat on its bones. Every beat and moment fully realised to create a warm tale of friendship and loneliness. Even the most fleeting comedic moments act as a counterpoint to the more adult themes, creating a perfect balance. An understated gem that packs big themes into a small package. Mamea offers us an opportunity to sit down with someone we are all familiar with, to empathise with them in the most direct way, and go away into the real world hopefully with more compassion. To, ideally, make us consider the Mamas in our own lives, and our responsibility towards them. A play that promises the audience laughter, but surprises by moving them too. 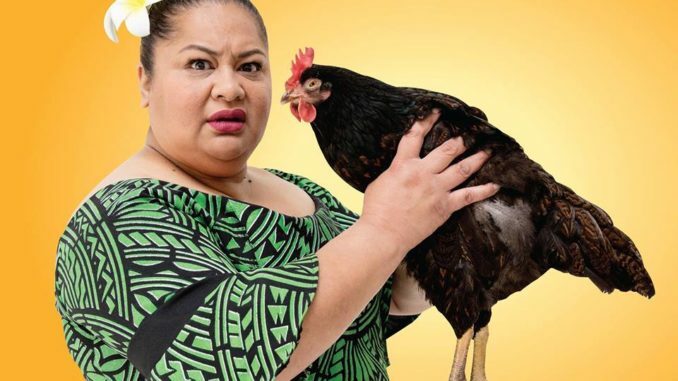 Still Life with Chickens is presented by Auckland Theatre Company and plays at ASB Cube Theatre until 24 March as part of the Auckland Arts Festival.